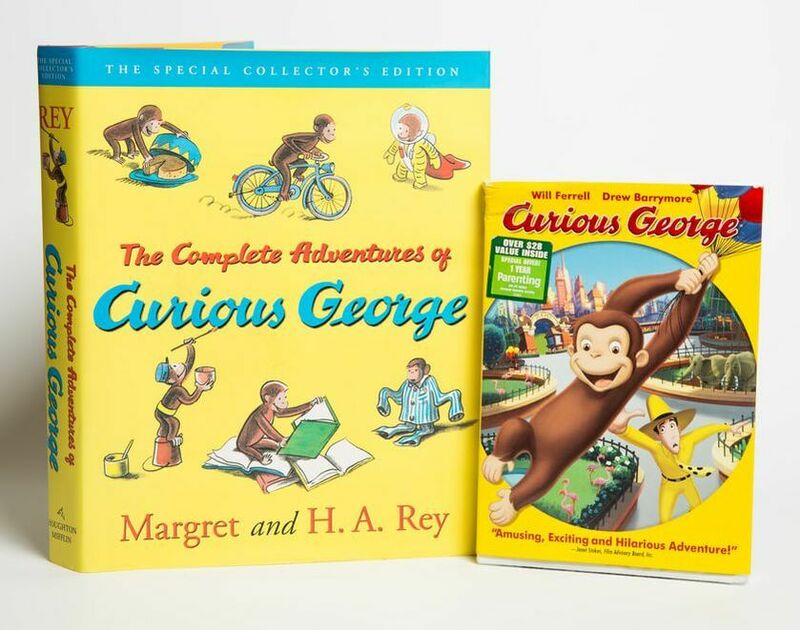 MOTAL is delighted to have The Complete Adventures of Curious George and a companion DVD. The book is labeled “The Special Collector’s Edition” and is quite large (8 x 10 inches, and 1½ inches thick) and heavy (2 pounds). It warrants being handled by an adult to share with a young child, and it has the potential to bring them many shared moments of laughter and closeness. George is beloved by all for his happy demeanor and his inquisitive adventures that always get him into funny predicaments. The DVD is a G-rated production that features voices of Will Ferrell and Drew Barrymore. MOTAL’s Curious George set was donated by Ken Krakowski in 2006. He wanted to share it because Curious George inspired him to enjoy reading for the first time when he was a boy. Curious George has been a favorite character for children around the world. Translated into more than twenty-one languages, and with seventy-five million copies printed, the charming little monkey and his “Man in the Yellow Hat” have brought fun reading for over seventy years. Curious George authors Margret and Hans Rey escaped occupied Paris on a homemade bicycle in 1941. Riding toward freedom, the couple made their way to Lisbon, where they were able to sail from Europe to Brazil; they had met and married there five years earlier. While living in Paris, the couple produced their first children’s book in 1939. Titled Cecil and the Nine Monkeys, the book featured a little monkey named Fifi, later renamed Curious George. The Reys continued to collaborate on the adventures of Curious George, with Margret writing the stories and Hans providing the illustrations. In 1963, the Reys moved to Cambridge, Massachusetts, overseeing the creation of the popular Curious George series on PBS and other animated feature films. The couple remained in Cambridge for the remainder of their lives. Today children and their families continue to enjoy the tales of a little monkey who rides a bicycle to adventures in his neighborhood and around the world.